After bottoming out at a new weekly low of $2,120, bitcoin has managed to recover past $2,600 and maintain a reliable trading range between $2,484.64 and $2,674.98 respectively. A clean ascending channel had formed but was broken with ambivalent horizontal trading. 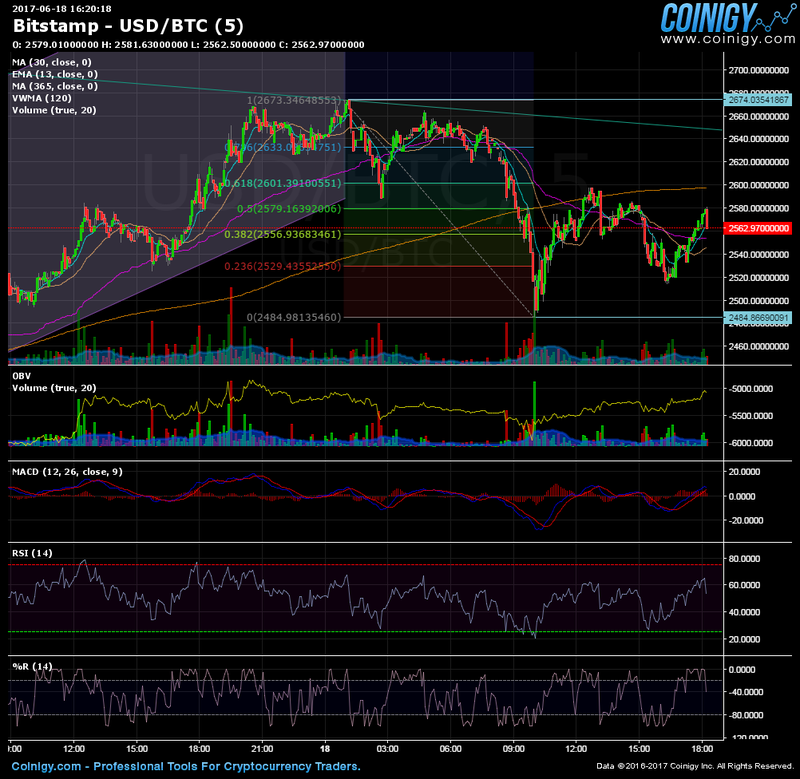 However this has granted the market some time to consolidate. Volume has remained stable despite the short-term outlook and at present does not show signs of wavering. A breakout above $2,802.04 would be needed in order to fracture the ongoing market momentum and to serve as support for new upward price movement. Should a dip below today’s daily low of $2,485.83 happen, we could see a test of the previous $2,120 weekly low and a decline past the corresponding new support levels now apparent at $2,400.34, 2307.88 and $2,197.98. Existing price disparities among BTC/USD pairs on the largest bitcoin exchanges have not really changed in these last few weeks. OKCoin and Huobi still trade at the highest premiums; although this is to be expected considering that Yuan based crypto currency pairs are dominant on both Huobi and OKCoin. LakeBTC has a slightly lower premium than the aforementioned two while Kraken, Bitstamp, Bitfinex and BTC-e have the most similar price movement/disparities. Among all bitcoin exchanges, USD denominated trading is still dominant and is holding 43% of overall volume. EUR/BTC trading is at 20% of overall volume, with the majority of EUR trading being conducted on the Kraken exchange. JPY accounts for 13%, CNY 12% and the KRW for 6% of overall trading volume. 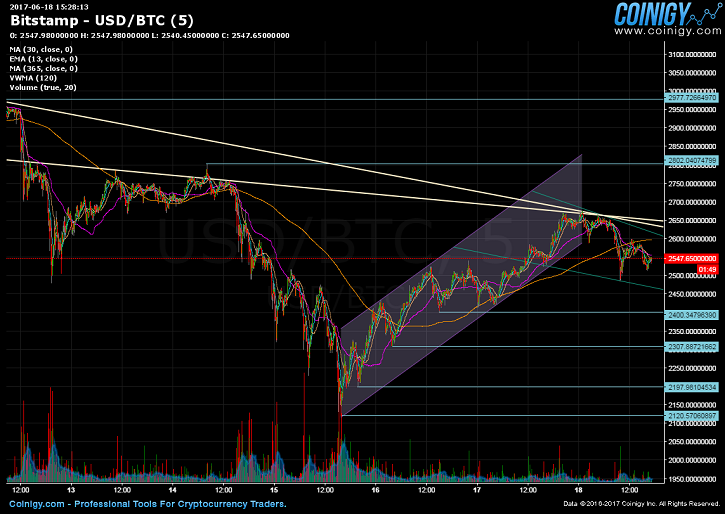 The Fibonacci 0.50 line at $2,579.19 seems to be a necessary tipping point, showing some short-term resistance. A more detrimental push beyond $2,601.30 (Fibonacci 0.618) and $2,633.01 (Fibonacci 0.786) is going to be required before the daily candle close if bitcoin is to break out of the existing trading range. RSI appears overbought at the moment but seems to follow the existing price trend and overall market movement. No lasting or substantial divergence with the Williams %R indicator, which is also mirroring RSI performance for now. The same is true for the MACD, no immediate divergence in relation to total market trading or price fluctuations. In sharp contrast, OBV seems to be rising steadily even though volume is not following suit. Bitcoin started trading on June 18 at $2,651.37 (GMT 00:00 – BitStamp) and fell at one point to a new daily low of $2,485.83 (GMT 08:00). The trading price has fluctuated within a fixed range from $2,674.98 down to the previously mentioned daily low of $2,485.83 (GMT 08:00).